Local Council Member Peter Koo said he opposes bike lanes in downtown Flushing, but his staff suggest he's open to the idea. Downtown Flushing is one of the most crowded and bustling places in New York City, but getting around on a bike is tough. The streets are crammed with cars, and there is next to no bike infrastructure in the neighborhood. 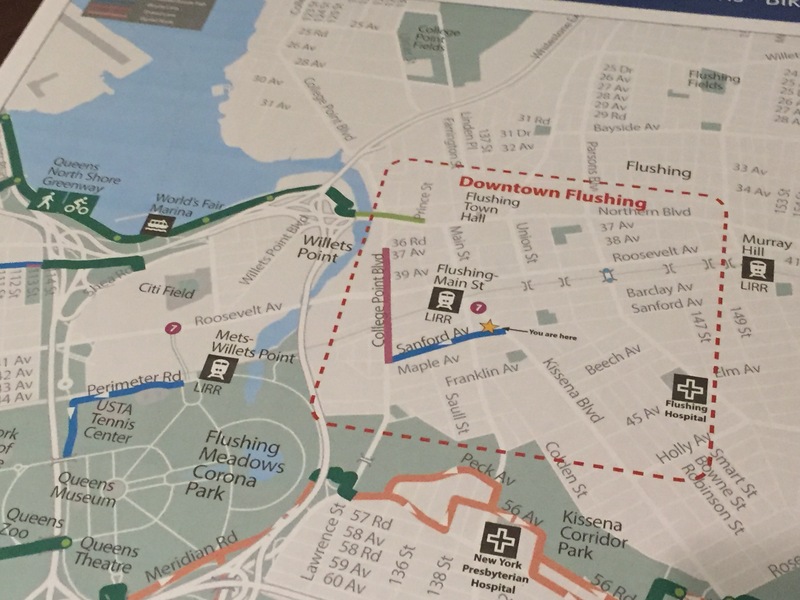 At a DOT forum last night to plan for better bicycling conditions in downtown Flushing, Council Member Peter Koo told the packed room he wants to keep it that way. Koo did not stick around for the rest of the meeting, but if he had, he would have heard a different story from his constituents, many of whom see biking as the only viable way to get to Flushing’s downtown core. About 70 people, speaking at least five languages between them, turned out last night to talk about the challenges of biking in Flushing. The event was co-sponsored by Koo and the Greater Flushing Chamber of Commerce. “Hopefully DOT can help us, listen, and address some of these issues through planning and analysis of the streets, and hopefully come to some kind of implementation of specific infrastructure in Flushing that will help improve safety, reduce congestion, and support our businesses,” said Chamber of Commerce Executive Director John Choe. The area around Flushing’s Main Street is a major draw and a short, bikeable distance from other densely populated Queens neighborhoods. But at the moment, there aren’t any bike lanes in downtown Flushing except for a few blocks of Sanford Avenue. Nearby Flushing Meadows Corona Park is only accessible by cutting through the parking lot of a Home Depot and under the Van Wyck Expressway. On Flushing’s car-oriented streets, biking is a “nightmare,” said Jane Liu, a Jamaica Estates resident who grew up in the neighborhood and still bikes there to see her parents. They live two miles away from downtown but drive there. “My father bikes and my mom, she’ll be convinced if there’s a bike lane, but right now there’s no bike lane,” Liu said. “Flushing is one of the major destinations for Asian people to go to,” said Kai Chang, a Chinese immigrant who comes into the neighborhood from Long Island. When everyone drives, there is simply not enough room to move and store all the cars. “I usually park my car in the [Kissena Park] area, and then bike to the downtown area,” Chang said. Translation services were offered last night in Mandarin, Cantonese, Spanish, and Korean. Suggestions from the Mandarin group, mostly elderly men who use bikes as their main mode of transportation, included signage indicating the presence of bikes and protected bike lanes on 46th Avenue and Bowne Street. Other groups wanted to see safer connections to Corona and Jackson Heights to the west and Bayside to the east. Koo was referring to the sidewalk expansion along Main Street, which is currently nearing completion. But maintaining the status quo on the streets won’t help, Choe told Streetsblog. Scott Sieber, Koo’s communications director, clarified that the council member could be open to bike infrastructure improvements, including bike lanes. “This is just a forum. I think [the] councilman was just trying to get some of the hyper reactions at ease a little bit and say, look, you’re not going to wake up tomorrow morning to bike lanes in front of your house,” Sieber said. There are so many cyclists – especially senior citizens in Flushing who deserve to travel safely to and from their destinations. I hope the city will put forward an aggressive plan for bike accessibility in Downtown Flushing. Motor traffic is of course a nightmare, worse than anything in west LA. I live close to the Flushing neighborhood and would absolutely love to be able to ride my bike safely to downtown Flushing. There are so many great restaurants, cafes, etc. there and it’s a shame that only people willing to sit for an hour in traffic are allowed to enjoy it! If bike lanes existed I’d be the first person on it! Older residents in Flushing who prefer not to drive for safety reasons should be permitted to ride their bike instead. To deny them the right to use a safe and healthy form of transportation to get around is ageism and possibly elder abuse! Join us @Firestar! Transportation Alternatives Eastern Queens meets at the Quaker Meeting House at 7:30 on the third Monday of every month. (Tonight, June 19th). We always welcome folks who want to work on a project to make our Olde Towne of Flushing a better place. Flushing is Most Dangerous Place to Walk in Queens — So Where is Council Member Peter Koo? Flushing residents are clamoring for safer streets. If only their city council member cared.